NEW YORK, N.Y -- It all feels different now. Two fights ago, Sergey Kovalev was tense. Relations with his trainer had been deteriorating for over a year. Trust had evaporated, on both sides. The Russian was heading into a rematch with a man who officially had defeated him in a contest in which Kovalev was sure he was the deserved victor. He felt that everything and everyone was against him, and when the tide of the rematch joined the rest of the world in beating him back, he effectively acquiesced, crumpling on the ropes as Andre Ward once again emerged triumphant – this time more definitively. By the time of his most recent bout, Kovalev’s world had changed. He had drunk too much, survived a car accident, visited a monastery. Of perhaps greater moment for his boxing career, he had changed trainers, selecting a cornerman of whom few in the United States had heard but with whom he felt comfortable. Entering his contest with Vyacheslav Shabranskyy last November, he was to all outward appearances relaxed and back on track; even so, there was a degree of anxiety as he entered the ring. Not only had he suffered two losses in a row, but almost two years had passed since he had last scored a knockout. For a fighter nicknamed “Krusher”, that was a confidence-sapping drought; his nervousness before facing Shabranskyy was less over whether he might lose – although no boxer could ever discount such a possibility – than whether he could win in a manner befitting his reputation, whether he still had the ability to lay out his opponents in devastating style. In the event, he dispensed with Shabranskyy with an even more violently ruthless efficiency than he likely dared dream; and now, with his next fight a day away, Sergey Kovalev appears to be a man at peace with his lot. His commitment to living the athletic life is recharged, and he has placed his professional fate singularly in the hands of his trainer, Abror Tursunpulatov, a retort to some of the cynicism that met news of his appointment. There was some assumption that Kovalev, whose dedication to his training had been waning, had selected somebody who would not push or boss him but would allow him to set his own parameters; instead, at least by Kovalev’s telling, the exact opposite has happened. The fighter professes to have yielded compete control to the trainer, feeling able to do so in part for the simplest of reasons: the two men literally speak the same language. As improved as Kovalev’s English has become in the years that he has been living in the United States, his thoughts are still in Russian. His words flow more easily in Russian. In those vital seconds between rounds, when a trainer’s advice may need to be offered, distilled, and digested, it is to his advantage if those words are delivered in Russian. And, Kovalev offers, an easier and deeper comprehension allows for greater trust and a readiness on his part to place himself “one hundred percent” at the direction of Tursunpulatov. As a result, he says, he believes he will enjoy his new spell atop the light-heavyweight division – a position he assumed by default following Ward’s retirement – more than the previous one. He certainly looked trim and fighting fit at Friday’s weigh-in for his bout on Saturday night with compatriot Igor Mikhalkin, who will be aiming to ensure that Kovalev’s second reign is an abbreviated one. The two men know each other a little as a result of having competed on the national team together as young amateurs, but they are very different fighters as professionals. Whereas Kovalev is seek-and-destroy, Mikhalkin is more confuse-and-obfuscate, a tricky southpaw with awkward boxing skills – but, as he is the first to confess, not much in the way of a power punch. He has the ability to make life difficult for his fellow countryman, but realistically, if the New Kovalev is to prove on a par with or even better than the Old Kovalev, Mikhalkin is the sort of opponent with whom he should dispense. Stiffer challenges await, most likely in the form of one of the two men who are squaring up to each other in the co-main event. 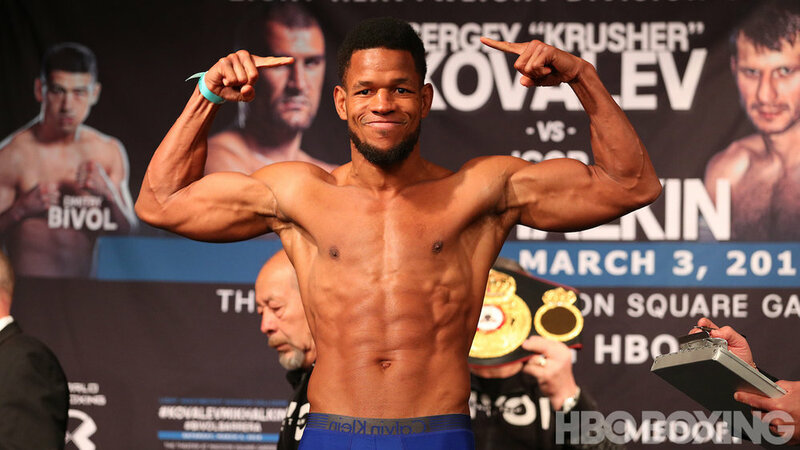 Sullivan Barrera – who has battled Ward and beaten Shabranskyy and the likes of Joe Smith Jr. and Felix Valera – had the option of facing Kovalev on Saturday but instead elected to battle undefeated Dmitry Bivol, a challenge that seems on paper no less risky and for less apparent reward. Barrera is battle-hardened, savvy and skilled; but Bivol, last seen flattening Trent Broadhurst inside a round, might be special. If he is, then Barrera is the level of opponent who should bring the very best out of him and allow us to see how good he really is; Barrera’s calculus will be that Bivol is not yet ready for the depth of water into which he will be aiming to drag him. It promises to be a fascinating battle out of which the One True Challenger to the crown will emerge. The ultimate battle lies ahead; Saturday night will reveal its combatants.